As we walk my “mile”, the first business along my route was literally right out the door. My father owned a wholesale produce distribution business that was located behind our home. Evolving out of a business that he started in Holyoke at the height of the Great Depression, a new warehouse was build in 1953 (the year I was born), state-of-the-art at that time, and expanded upon 5 years later. In later years there were missed opportunities, and despite the fact that the business was named “Edward Pelland & Sons”, there were no concrete plans for succession, and the business no longer exists. Diagonally across the street, a home-based hairdressing shop was built in the early 1960’s. No doubt several owners later, it still is a hairdressing shop, though presumably serving an ever-aging clientele. On the next block came Du-Well Products, a small wholesaler of bleach and cleaning products. Another family-based business with no succession plan, the building now appears to be vacant although it recently housed a Glass Doctor windshield replacement business. A block in the other direction, there were two neighborhood groceries (Roger’s Cash Market and Milkay’s Market) along with a small Mobil gas station and a hardware store. The markets are long gone (one has a sign that says “Sue’s Ceramics”), and the site of the gas station was later a Cumberland Farms convenience store before becoming the Highland Farms convenience store that is there today. The F&M Hardware Store, being almost across the street, was one of my childhood shopping Meccas. More familiarly known as Makowski’s Hardware (the “M” of “F&M”), it was run by a friendly, old Polish lady (who may have only appeared to be old to a 7 year old) who was endlessly patient with a young customer whose typical purchases might consist of 10 nails or 2 nuts and 2 washers to fit the two bolts that were already contained in my parts inventory. Thanks to the gift department at F&M Hardware, I always had a source for the perfect birthday or Christmas gifts for my parents and siblings. It was amazing how, if I only had a dollar in my pocket, that little gift for my mom was suddenly marked down to $1.00. Mrs. Makowski (who had legally changed her name to McKay, although that seemed too difficult for me to remember) was the patron saint of patience and customer service, whether or not she was knowledgeable about hardware. Of course, F&M Hardware – at the time one of two full-service hardware stores within my linear mile – has long gone out of business. When it first closed, it became a military recruitment office, selling to a slightly older customer base. A neighborhood loses a whole lot more than just another small business when it loses its hardware store. Back on the walk to school, Gert’s Laundromat served families in the neighborhood who didn’t have their own clothes washing machines. This self-service laundry was a pioneering concept at the time when the business was launched, and it was followed next door by another new concept – a sequel of sorts – Gert’s Self-Service Car Wash. (Those monsters that took us out of our neighborhoods needed to be kept clean, and a hose and a pail of soapy water were just so old-fashioned in the atomic age.) The laundromat has been long vacant, and the car wash was converted to an auto repair shop years ago. Less than a block from Gert’s enterprises was the home-based Cohen’s Seltzer. Without a sign out front, Meyer Cohen’s business was somewhat mysterious, a perception that was certainly helped by the fact that the house was a dead ringer for the one occupied on TV at the time by The Addams Family. Cohen’s sold the kind of refillable seltzer bottles that were Clarabelle’s trademark on the Howdy Doody Show. About all I remember about this business is that I got the nerve to ring their doorbell on Halloween one year. The house was in total darkness, and I was given two black jelly beans. The Cohens were the only Jewish people I’d meet until I would go to college. The house later appeared to be converted to a multi-family dwelling and for a while had a used car lot on the premises. It has since been restored to a classic Victorian residence. groceries, an old pay phone, pinball machine, and self-serve popcorn machine. On the next block, on the corner of Artisan Street, stood Talbot’s, a small service station that sold Esso Gasoline, when “Esso” was an acronym for “Standard Oil” before it evolved into the more modern-sounding “Exxon”. The site of Talbot’s Service Station, as well as the adjoining residential housing at the corner of Warregan Street, became the footprint for the Willimansett Nursing Home West in the 1970’s, joining the original Willimansett Nursing Home that had displaced one home and a vacant lot across the street in the late 1960’s. As the neighborhood population aged, it is no surprise that there would be a demand for new senior care facilities. On to the next block, between Warregan and Norman Streets, we have a survivor of sorts. Although there is no sign identifying the business, the Colonial Cafe still appears to be an old watering hole. Also gone are the old Hampden Beer & Ale signs that glowed in the small, out of reach windows in my youth. I presume that these windows were intended to conceal the identity of the patrons who would later stagger out the door and be on their own. In any event, not much appears to have changed. Further down this same block came Jorczak’s Pharmacy and Serge’s Barber Shop, occupying a duplex storefront. Needless to say, most neighborhood pharmacies are long gone and a throwback to the days when doctors prescribed paregoric for babies with stomach aches. At this time, including the Rexall in the opposite direction from our house, Willimansett had four pharmacies. Jorczak’s was my favorite because it had a soda fountain. The combined space of the pharmacy and the barber shop (one of three in Willimansett, although now there are none) has a sign that reads “Interstate Custom Kitchens”. I presume that this is an active business, although on a recent drive-by, most of the current storefronts showed little, if any, signs of life. This photo, provided by Bill Santy, was taken in July of 2013.
most of whom lived near the Y in Willimansett in the 40s and 50s. Older than I was at the time, most were born between 1939 and 1942. Frank Tatro, Ren Gladu, Len Sabourin, Bill Santy, and Gerry Robinson. Sitting, left to right: Bob Garstka, Fran Robidoux, Brent Schmidt, Norm Avey, George Como, and Charlie Albano. The next business after Lacroix’s was Masse’s Fish Market. The neon signs at Masse’s flash “Fresh Fish – Fried Fish”, and there were probably 20 or 25 customers lined up for take-out orders on any given Friday. That level of business markedly changed when fish markets everywhere were dealt a deadly blow by the Vatican. It was at this time that the Second Vatican Council decided that Catholics were free to eat meat on Fridays. There were three churches in Willimansett: St. Anthony of Padua (the Catholic parish that served the Polish population), the Church of the Nativity (the parish that served the French Canadian population), and St. Mary’s (the Catholic parish that served the Irish population) … clearly the days before ecumenism and a shortage of clergy forced integration. The math was clear. This was not a good time to be running a fish market in Willimansett, but Masse’s adapted to the sudden decline in demand. Although there is only a parking lot at the site of the original Masse’s Fish Market today, the business moved to Memorial Drive (in the Fairview section of Chicopee), where it opened a much larger, new seafood restaurant that appears to be thriving today, when many people have increased their consumption of seafood as a healthier alternative to meat. By adapting to the times and moving to a location with much higher vehicular traffic, Masse’s Fish Market has been a success story, although a loss for Willimansett. After Masse’s came the Frontenac Club, another tavern, set back from the road a distance, with a long canopied walkway to its entrance. Years earlier, in the 1920’s and ’30’s, this had been the location of the Holyoke Mirror Works, owned by my maternal grandfather, Donat Gauthier. Today this commercial property is vacant, although the apartments on the upper floors are probably occupied by tenants. Across the street is the old Chapin School, the City of Chicopee’s large public school serving the Willimansett neighborhood. My only memories of Chapin School are that its students seemed fond of starting fights with necktie-wearing Mount Carmel students who crossed their paths, and the school’s crossing guard, a retired member of the Chicopee Police Department who wore an auxiliary uniform and refused to help children from the Catholic school use the crosswalk. In a way, he was far ahead of his time, having actually originated the phrase, “That’s not my job.” Today, Chapin School is closed and apparently vacant, although other schools from its era have been converted to condominiums or other alternate uses. My guess is that Willimansett is not a vibrant condominium market and that renovation would probably be costly and involve some degree of environmental mitigation. Continuing our route beyond Chapin School, we unofficially enter the “Y” neighborhood and a transition to an increasingly Hispanic demographic. Just beyond the Chapin School, but on the opposite side of the street, is the site of the Aubuchon Paint Store. Aubuchon closed years ago and is now occupied by the Iglesia Fuente de Salvacion Misionera. After Aubuchon Paint came Perrault’s Market, one of the four markets in Willimansett at the time and also a family-owned business, as its name would imply. It also closed years ago and is now occupied by the Iglesia Movimento Misionero Mundial. In the interim years, it had been a square dancing club. 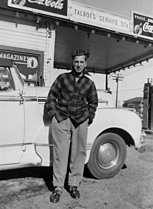 Opposite Perrault’s Market, and occupying the inner point of the “Y” itself, was the “Y” Garage, a service station that had been built by one of my uncles, Rheo Gagne, and was being run at the time by his sons, Rheo Jr. and Robert. Although the gasoline pumps (Gulf, I recall) came out years before lead came out of the gasoline, this garage is still in business under the name of Chicopee Tire & Auto. Auto repair, along with the sale of used cars, makes sense in Willimansett today. Across from the “Y” Garage was the small campus of the old Hampden College of Pharmacy. Built in the days before pharmacists simply counted pills and transferred pharmaceuticals from large bottles to small bottles, these somewhat ramshackle old wooden buildings fascinated me, with their windows showing lab tables covered with beakers, flasks, and test tubes. The Hampden College of Pharmacy closed at some point in the 1960’s, absorbed by the Massachusetts College of Pharmacy and Health Sciences (MCPHS University) in Boston, with the buildings demolished and replaced by the apartments that still occupy the site today. As we enter the base of the “Y”, after Meadow Street ends, the largest building on the East side of Chicopee Street, just beyond Rivers Park, is the site of the old Willow Theater, named after the weeping willow tree that grew next to the theater at the edge of its parking lot. The Willow, not surprisingly, was Willimansett’s only movie theater. Sadly, it closed early in the 1960’s, years prior to its counterparts in Chicopee Falls (the Falls Theater) and Chicopee Center (the Rivoli Theater). Of course, there were many more old theaters in Holyoke and Springfield. It is difficult to convert theaters to alternate uses because the sloping floors must be rebuilt. For a time after closing, the Willow became the home of Ray’s Super Market, which briefly brought Willimansett’s food market count up to five, but probably also helped to force the closure of nearby Perrault’s Market. How many markets could Willimansett support? Ray’s Super Market was owned by Ray Desrochers and had a fair number of employees, perhaps half of whom were family members. 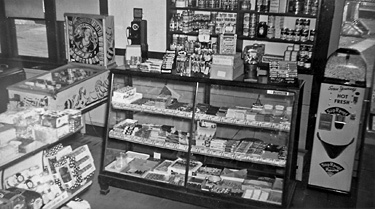 Ray’s first market was located in Aldenville, where it was fairly successful, at a time when neighborhood food markets were not yet losing their market share. The only real supermarket “chain” in the area at this time was the A&P, plus buying cooperatives like First National, ShurFine, and Sweet Life that mostly served the real mom and pop stores. Perhaps encouraged to expand by the owner of the leased property in Aldenville (Edward Lieberman, who not coincidentally was also the owner of the Willow Theater), rather than market research, Ray’s Market was a short-lived failure at its second location and closed after a few years of losses. Perhaps Ray’s Super Market saw this expansion as an opportunity to follow in the footsteps of The Big Y, which was in the early stages of its own successful growth and expansion, but that was not to be. The former Willow Theater is now a Pentecostal Center. Even Ray’s Market in Aldenville eventually closed, to become the home of a carpet and flooring business that only needed to change two of the letters in the big neon sign out front to transform from “RAYS” to “RUGS”. The main commercial district at the “Y” ran for one block along the West side of Chicopee Street between John Street and Whitman Street. Businesses in here at the time included Lapite’s Sweet Shoppe (which sold Russell Stover candies and Hallmark cards, along with a counter of penny candy which made it a mandatory stop on the way home from school). At the time, Lapite's was probably the defining mom and pop small business at the “Y”, run by owners Art and Connie Lapite. Not only did they work long hours, I do not recall there being a single employee other than the owners themselves, who actually lived in the house that was attached to the rear of the Sweet Shoppe. Lapite’s is now vacant and appears to be in a state of disrepair. Also in this block were a branch office of Holyoke National Bank, long closed and now occupied by a Liberty Tax Service office. (At least the location still deals in financial matters of sorts, but this is clearly not a survivor, with the parent bank itself no longer in existence.) A couple doors down was the office of the Willimansett Credit Union, also not only closed but no longer in existence. At a time when banks were expected to have their own parking lots and drive-up windows, banking with street-side parking in neighborhoods like Willimansett could not possibly survive. Other businesses in this stretch of real estate, at various times during the 1960’s – and now all closed – included Riopel’s Hardware, the “Y” Cafe (ironically one of the last survivors), the “Y” Package Store (the neighborhood liquor store which no doubt sold a good deal of Hampden Ale and Beer), the “Y” Barber Shop, Littlejohn’s Jeweler, the “Y” Fruit Company (better known as Caparoni’s Luncheonette, or simply as Cappie’s, after its owners, Aldo and Tillie Caparoni) ,and the “Y” Pharmacy (also perhaps better known by the name of its owners as Fisher’s Drug Store). There was an easily distinguished pattern with these businesses, each known as well or better by the name its owners than by the name of the business itself. In several instances, such as Lapite’s, Riopel’s and Littlejohn’s, the business names and the owners’ names were one and the same. That was the nature of the business community at that time. There were small businesses like these, and then there were the factories of Holyoke, Springfield, Chicopee, and Chicopee Falls. Interestingly, few of either the small or big businesses of the time have survived. The former business locations at the “Y” now present a mix of vacant properties and the Assembléia de Deus, the Ministério na Unçáo, Natural Tasté Hair Boutique, Custom Cuts, and the Wang Garden Chinese Restaurant. The Riopel’s Hardware location was recently occupied by a Sprint store, and the storefront next to the old “Y” Pharmacy was recently occupied by Jackson Hewitt Tax Service. Beyond Whitman Street and Valliere’s Pharmacy was the red brick Church of the Nativity, a historic building that was all too willingly offered up for demolition to accommodate the elevated highway of Interstate 391 that would, perhaps more than any other single factor, lead to the permanent dissection of downtown Willimansett. This original Nativity Church had a tall steeple, balconies, and a basement auditorium that served as the location for meetings of the parish’s boy scout troop, the League of the Sacred Heart (a Catholic men’s organization), and the Holy Name Sodality (the women’s equivalent). This church was considered such a permanent landmark that there was actually a U.S. Coast and Geodetic Survey marker (typically located on mountain peaks such as nearby Mt. Tom, in Holyoke) located in the steeple. Despite the positive thinking of the U.S. Coast and Geodetic Survey (which itself no longer exists, incorporated into the National Oceanic and Atmospheric Administration, in 1970), the site of the church is now occupied by the highway, a small parking lot, and a few park benches. Ironically, the logic for the parking lot was to provide convenient access for the businesses that the highway would only bypass and help to kill. Unfortunately, there was little to no opposition to either the demolition of the church or the construction of the highway that was supposed to help to revitalize downtown Holyoke, which was already well into its own decline at the time. In every respect, this Interstate highway spur has been a total failure. Adding further to the travesty, the “new” Church of the Nativity was slated for closure by the Diocese of Springfield in the Fall of 2009, a financial casualty of the combination of declining enrollments, a shortage of clergy, and massive settlements paid to the victims of sexual abuse (primarily altar boys from this time period). Back in the 1960’s, prior to the decline in vocations, there were almost always three priests in the parish (the pastor and two curates), who lived in the rectory next door, as well as perhaps 20 or 25 nuns who lived in the parish’s nearby convent on St. Louis Avenue. Next door to the church and rectory was my daily destination, the parish’s Mount Carmel School, a yellow brick building built in the second decade of the twentieth century. Mount Carmel was the parochial school that served families in the Willimansett and Fairview sections of Chicopee, as well as families from Westover Air Force Base. 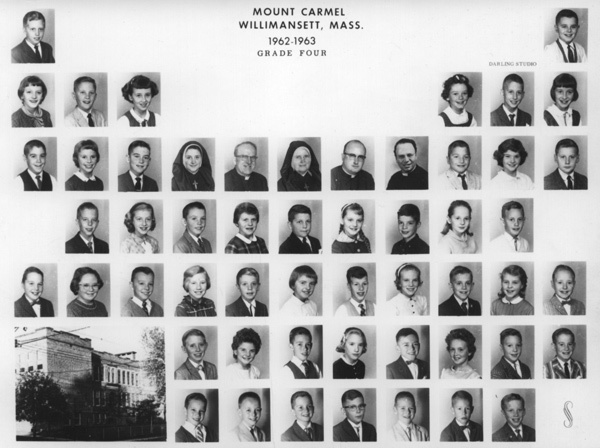 I enjoyed my years at Mount Carmel School. The Sisters of the Presentation of Mary were far friendlier than the Sisters of Saint Joseph, to whom I would be subjected in my far less enjoyable high school years. During my nine years of attendance, the school changed significantly. The kindergarten was eliminated soon after I attended that pre-school grade, as were the parish carnivals that were held in the front schoolyard each year. One constant was the school custodian, Mr. Giguere, who had none of the cranky attitude of the crossing card at Chapin School down the road. He clearly liked kids, and he seemed to wear a multitude of hats within the parish, including the school, church, rectory, and convent. As the school custodian, he seemed to be responsible for just about everything, including maintenance, repairs, cleaning, feeding the enormous coal furnace in the basement, and serving as the school crossing guard three times a day. As a crossing guard in the early 1960’s, he was assisted by a network of “patrol boys” from the upper grades. Patrol boys were student crossing guards, identified by their white belts and badges, part of a program that originated with the American Automobile Association back in the 1920’s and which remained popular for many years in cities throughout the United States. As a first grader, I couldn’t wait to be a patrol boy, but, alas, the program would come to an end at the school long before I reached the upper grades. Along with an end to the patrol boys and parish carnivals, in subsequent years, enrollment declined, nuns were replaced by lay teachers, and the school closed. The school was sold by the parish in 2006, and it now serves as the headquarters of the Valley Opportunity Council, a social service agency with a variety of programs that serves the needs of 25,000 people in Hampden County. The modern replacement for the demolished Church of the Nativity was built in the front school yard when the property was still functioning as Mount Carmel School. Just beyond the school was the Willimansett branch of the Chicopee Public Library. As might be guessed, the branch library was closed several years ago. Its former location is now occupied by a business called “Games & Stuff”. Maybe, just maybe, some of those games can help to develop reading skills. Across the street from the school was Yvonne Hamel’s Music Studio (owned and operated, of course, by Yvonne Hamel) and Brunelle’s Funeral Home (owned and operated by the Brunelles). Both Yvonne Hamel and her music school are long gone, and the building is now occupied by the Willimansett precinct of the Chicopee Police Department. With extreme irony, while almost the entire small business community of Willimansett has died and disappeared, Brunelle’s Funeral Home remains one of the singular survivors. In the early 1960’s, Willimansett’s “Y” neighborhood had two schools, two banking institutions, a library, a music school, a pharmacological institute, a small but vibrant business district, and it didn’t need a police department. Next, we will speculate upon the root causes of these changes, surmise how changes for the worse may be overturned, and see how similar declines might be prevented from occurring elsewhere.